Introducing V-Go to the Patient is easy with these 5 tips from Jamie Brewer, Nurse Practitioner at the Diabetes and Endocrine Center of Mississippi. Jamie explains how she is able to have a successful discussion about V-Go in a way that encourages patients to experience first-hand the benefits of simple insulin delivery. To help your patients achieve maximum results and adhere to their therapy, you can help them understand how to use V-Go correctly. 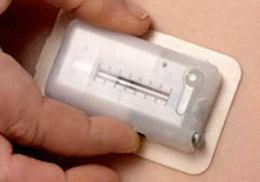 This informative video demonstrates for patients how simple it is to fill V-Go with insulin, how to apply V-Go, and how V-Go fits into their life on the go. Download the Quick-Start Guide for important information to help your patients get off to a great start with V-Go. 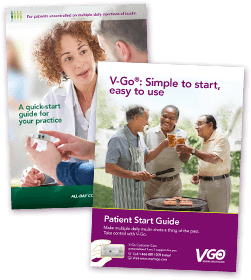 Direct your patients to download the Patient Start Guide for hints and tips to help get them successfully started with V-Go in a matter of minutes. Request more helpful resources for you and your patients. V-Go Customer Care is available at 1-866-881-1209 to provide your patients one-to-one support with a dedicated V-Go Partner. Every Wednesday at 1:00 pm ET, a V-Go Partner will conduct a live online demonstration (webinar) on how to use V-Go. It’s a great opportunity for you to ask questions or just watch to refresh your understanding of the Fill, Wear & Go process. 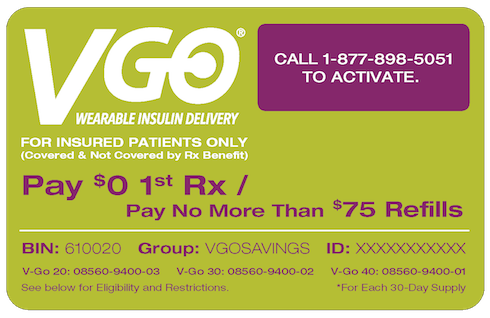 With the V-Go Cost Savings Card, commercially insured patients pay $0 for their first prescription at any retail pharmacy.† Refill cost will depend on the patient’s insurance plan, but will be no more than $75 using the V-Go Savings Card. §30-day public notice of cancellation. This card is NOT valid for prescriptions that may be reimbursed under a federal or state healthcare program, including Medicare, Medicaid, or any other similar federal or state healthcare program, including any state pharmacy assistance program. This card is only valid for insured patients.